A modern British restaurant and cocktail bar providing the best of new and old-fashioned British cooking, courtesy of head chef Richard O'Connell, who previously worked at The Groucho Club and One Aldwych. 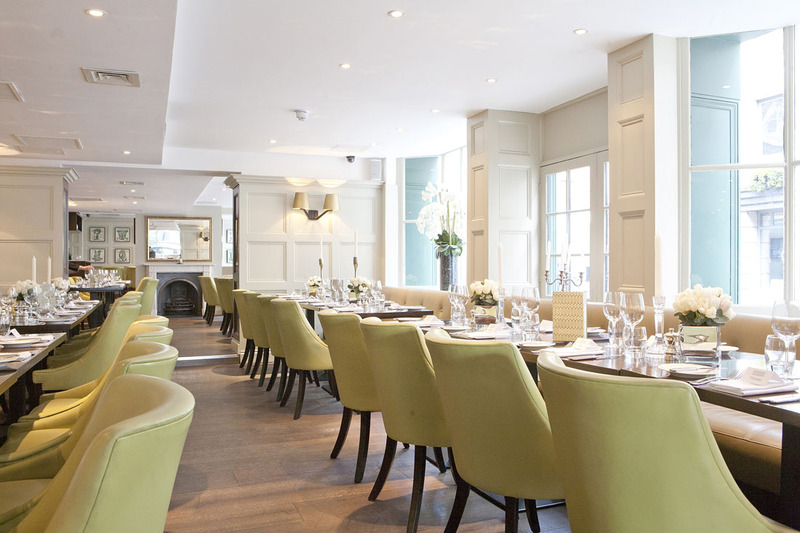 Chiswell Street Dining Rooms is open for breakfast, lunch, afternoon tea and supper. Reminiscent of a modern day drawing room, the wooden panelled dining room is smart and chic. Divided into three areas, literary inspired art and typography adorns the walls combined with stylish leather tub chairs, luxurious banquettes and a colour palate of creams, greens and golds to exude vintage class. Lunch revisits seventies gourmet gold, with dishes such as boiled bacon, cabbage and potatoes with parsley sauce; Cornish lemon sole with sauted potatoes, capers and dill; and Barnsley chop. Dinner spans a mix of recent decades and showcases a similar bold cooking style.